Santa Muerte, or “Holy Death” in Spanish, is widely regarded as the patron saint of the Day of the Dead, and of death in general. Santa Muerte is also the patron saint of people who have a hard time because they live on the edges of society. This includes not only criminals, but also the working poor, the LGBT community, the homeless, the mentally ill, and those suffering from addiction. In fact, Santa Muerte doesn’t reject any person from following her for any reason. 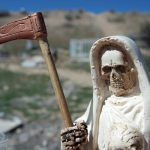 You don’t even need to be Catholic to make a connection to Santa Muerte! To death, everyone is equally worthy and welcome. Santa Muerte is a folk saint, which means she is not officially recognized by the Catholic Church. This hasn’t prevented millions of people from learning to love Mother Death. In fact, Santa Muerte worship is the fastest-growing new religious movement in the world. Santa Muerte appears as a female form of the Grim Reaper. Like the Grim Reaper, she is usually pictured as a skeleton wearing a long robe and bearing a scythe. Santa Muerte also has lots of pretty feminine details such as flowers and jewelry as well. Some people even dress their Santa Muerte statues in elaborately embroidered dresses! Her skeletal but lovely appearance has given rise to many of her titles – La Huesada (the Bony Lady), La Niña Bonita (the Pretty Girl), and others. 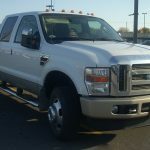 Why Work with Santa Muerte? Santa Muerte has a warm and friendly personality despite being patron saint of death. She is fiercely protective of her devotees and she likes to indulge them. How does Santa Muerte do this? Health, wealth, wisdom, and success are all within Santa Muerte’s power to give. In fact, Santa Muerte can do pretty much anything you ask! After all, death is one of the most powerful – and ancient – forces in all of creation. The best part about working with Santa Muerte is her legendary speed. It’s often been said that nothing is faster than death, and that’s true. 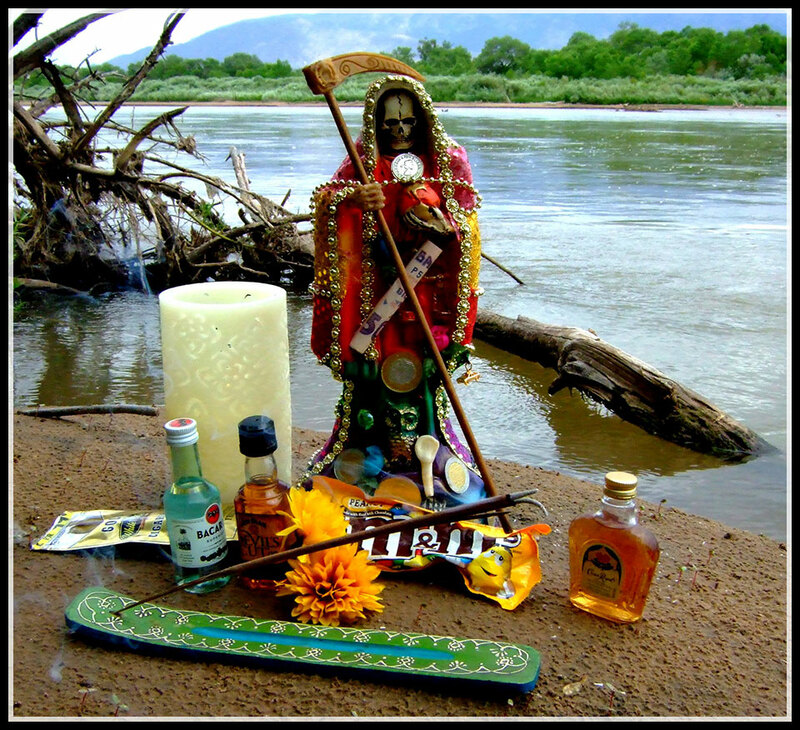 Santa Muerte grants favors and requests often in a matter of just hours or days. Santa Muerte is thought to have either three or seven different aspects, depending whom you ask. These different aspects are differentiated by colors. The three color model is very traditional, but I prefer working with her seven colors instead. The reason I prefer the seven colors of Santa Muerte is that I feel it makes accessing her wide range of powers much easier. The white aspect of Santa Muerte is called upon primarily for purification and protection, as well as to bless new beginnings. The yellow aspect of Santa Muerte is relied upon for money spells and luck in gambling. 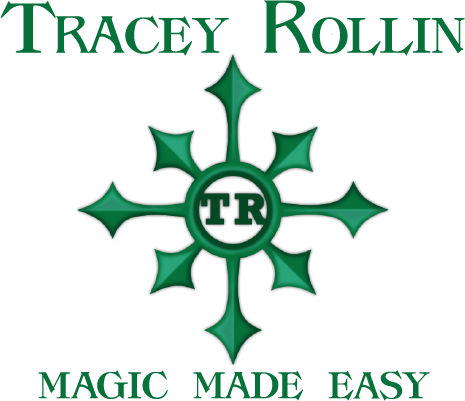 She also provides the vital infusion of living energy needed for healing spells. The blue aspect of Santa Muerte grants both empathy and practical knowledge. She also helps form the relationships that make a household or a community work. 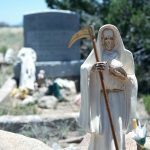 The green aspect of Santa Muerte deals primarily with justice, often intervening in court cases and bureaucratic legal proceedings. The red aspect of Santa Muerte deals with love and lust. This is whom you petition to get a lover – or to get your lover back! The purple aspect of Santa Muerte grants wisdom and psychic insight. She also grants the magical knowledge that the blue aspect of Santa Muerte does not. The purple aspect of Santa Muerte assists with the casting of spells. The black aspect of Santa Muerte is a powerful protector, as well as an expert at breaking spells, curses and hexes. She also opens the doorway to the spirit world, and can allow communication with spirits of the dead.ls. 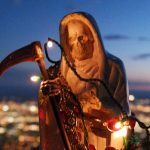 How do I work with Santa Muerte? Working with Santa Muerte is pretty simple straightforward. All a simple Santa Muerte altar needs is a picture of her and a candle. With even so few tools, you can be successful! The Mother of Death appreciates all the attention that her children give her, so your altar doesn’t have to be elaborate or expensive. Details on an easy way to call Santa Muerte can be found here. Anyone can use this method, even someone who is a beginner at magic! 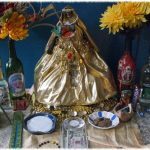 If you are interested in learning how to work with the seven colors of Santa Muerte, or learning how to set up a magical altar dedicated to her, you’re in luck. In September of 2017 my book, Santa Muerte: the History, Rituals and Magic of Our Lady of the Holy Death, will be published by Red Wheel / Weiser Press! 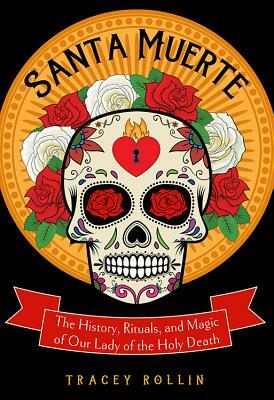 This book details the history of Santa Muerte, and explains how death can be viewed as a creative feminine power. It also gives precise step-by step-instructions on how to set up and consecrate your own Santa Muerte altar to begin working with the powerful Saint of Death.